Laparoscopy is surgical procedure that we perform at the Penn Medicine Princeton Medical Center of Princeton in Plainsboro, or more commonly at the Distler Surgical Center on the hospital campus. Evelyn in our Lawrenceville office 609-896-0777 ext 218 can schedule this for you. Usually, they are performed on Tuesdays. You will be instructed not to eat or drink anything after midnight before surgery and continuing into the morning of surgery. After inflating the abdomen with carbon dioxide gas, a telescope like instrument with a device called a trocar is inserted in the abdomen, usually in the belly button area. One or more additional incision sites will likely be required to insert any needed instruments. 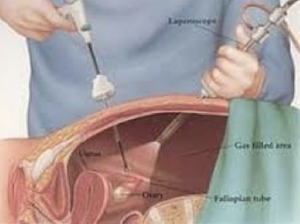 Once the laparoscope is inserted, the surgeon will look around and inspect for abnormalities in the pelvis such as endometriosis (the presence of tissue that resembles the lining of the uterus), scar tissue, ovarian cysts and fibroids (benign muscle tumors of the uterus). We also may inject dye to determine if the fallopian tubes are open. Some of these issues may be treated at the time of surgery, some not treated and others might require a more major operation to address it at a later date. The operation can take anywhere from 15 minutes to 2 or more hours, and you will usually go home an hour or two after surgery. Because of left over gas in the abdomen and the way the nerves are wired in your body, it is common to experience chest and shoulder pain in the first day after surgery. Most patients will go home with a prescription for generic Percoset or a similar narcotic. Once the pain begins to improve, you can switch to over-the-counter ibuprofen (Advil, Motrin, etc.) 3 pills every 6 hrs as needed. Narcotics are very addictive so please try to limit their use. The incisions are closed using suture material and covered with a superglue-like material called Dermabond. This will usually fall off on its own in a few weeks. On occasion, patients will have black and blue markings on the abdomen after laparoscopy. They eventually will resolve on their own and are not concerning. The complications of laparoscopy include bleeding, infection, development of blood clots, problems with anesthesia and injury to nearby organs such as the intestines and the urinary system. Other than a mild wound infection, these complications are not common.